The West Asheville-Aycock School Historic District, which was listed in the National Register in 2006, encompasses a small collection of one- and two-story commercial and civic buildings located in the 400-block of Haywood Road in West Asheville and built between 1915 and 1936, with the notable exception of the Charles B. Aycock School and Gymnasium, erected in 1953. The period of significance for the historic district is ca. 1915 to 1956. The West Asheville-Aycock School Historic District Boundary Increase consists of the Mardis Building, a two-story multi-use brick commercial building erected in 1925 at 444 Haywood Road. The Mardis Building was not included in the original nomination due the application of façade veneer and remodeled storefronts that significantly altered its architectural character and integrity. Like the city of Asheville on the east side of the French Broad River, West Asheville began a fifty year period of growth and development in the late nineteenth century with Haywood Road emerging as the principal commercial corridor west of the river. The West Asheville Improvement Company, founded in 1887, developed Haywood Road as the main commercial area with residential neighborhoods extending south and east toward the French Broad River. West Asheville was incorporated as a separate municipality on two occasions: the first time between 1889 and 1897 and again between 1913 and 1917. Beginning in 1910, a streetcar line was extended from the bustling Depot Street area on east side of the river across the new reinforced concrete West Asheville Bridge and along the Haywood Road corridor in West Asheville. The streetcar helped to support a thriving business community and surrounding residential neighborhoods in the early twentieth century, and Haywood Road was largely developed by the time streetcar service ended in 1934. Streetcar service allowed West Asheville to develop as a suburb of Asheville by providing easy access across the river and into downtown. The residential neighborhoods that developed on the north and south sides of Haywood Road were also home to the many small business owners and employees living and working in West Asheville or in the industries located along the river leading to the distinct character of the area. Built in 1925, the Mardis Building was the largest commercial building near the intersection of Haywood Road and Westwood Place, which began developing during the second period of West Asheville incorporation. The area around the intersection became a center of commercial and civic activity, with several businesses, the former West Asheville Post Office (#416), West Asheville Fire Station (#421-423), and the West Asheville Graded School. In 1927, the imposing Neoclasical Revival-style Bank of West Asheville Building (#414) was erected at the intersection of Haywood Road and Richmond Avenue. However, most of the brick commercial buildings in the West Asheville-Aycock School Historic District were executed in a relatively plain, utilitarian style, as evidenced by the ca. 1925 West Asheville Motor Company Building (#401) and the ca. 1924 Buckner Building (#415). Both buildings employ simple brick bands or corbelling and cast-concrete elements to enrich their brick facades. The two-story building at 418-420 Haywood Road, built around 1915, has a low stepped parapet, concrete coping, and a decorative metal grille centered in the upper façade. Three groups of three-over-one windows with concrete sills are located on the second story above the two storefronts. The Mardis Building was home to numerous businesses and individual residents, and a few of the prominent early tenants included the Mutual Coal Company and West Asheville Furniture Company, which were in business here until 1932. J. S. Mardis operated a shoe store for a couple of years in the 1920s and moved his real estate office to one of the second-story rooms. Dr. Anderson helped to organize the West Asheville Merchants Association in January 1926, which kept an office on the second floor of the building. In addition, the second-story was occupied by an attorney, a physician, and six residential tenants. During the Great Depression, the building stood largely vacant, with only a few tenants appearing in city directories. The W. A. Wilson Plumbing Company was located in the building from 1931 to 1936, one of the few businesses to last more than a year or two at this location until after the start of World War II. Walter A. Ward, owner of Ward Printing Company, published the West Asheville News at this location beginning around the 1941; it remained here until 1965. Frank Austin bought the building around 1942, and it became known as the Austin Building and the Austin Apartments. The Frank Austin Company, a building supply firm, occupied the majority of first-story commercial space and was the principal tenant until 1957. It was superseded by several short-term businesses and then from 1963 to 1973 Al’s Art Craft, a furniture and upholstery business owned by Albert Ellison. Between four and ten of the second-story units were rented to residential tenants every year from 1942 until the building was sold to the Ace Appliance Company. In 1974, the Smith family purchased the Mardis Building (then known as the Austin Building) to house their business, Ace Appliance Company, which was founded in 1956 by Jim Smith. Smith’s sons, Bruce and Wayne, took over the business in 1964. During the 1970s and 1980s, the Smiths remodeled the building and first-story retail spaces for their showrooms. A plywood façade was applied in the 1970s that completely obscured the original brick façade; the storefronts were enclosed with brick or otherwise remodeled into new entrances. Ace Appliance Company remained in this location until the business closed in 2008. Rehabilitation of the Mardis Building has helped to restore its architectural character and integrity such that it contributes to the West Asheville-Aycock School Historic District. The removal of exterior veneer has revealed the original brick façade, fenestration patterns, and decorative elements. Rehabilitation of the storefronts and replacement of missing sash with six-over-six windows has re-established the visual character of the building. The storefronts were all replaced at some point in the second half of the twentieth century, but they are rehabilitated according to a 1926 photograph of the façade and ghostmarks found on the interior, which indicate that they were composed of a recessed single-leaf door at the center with display windows above low, paneled wood bulkheads that angled back to the door. The interior of the building is rehabilitated to the Secretary of the Interior’s Standards for Rehabilitation and retains its four first-story commercial spaces, as well as its double-loaded corridors and multiple residential units on the second story. The two-story Commercial-style Mardis Building is consistent in scale, form, materials, and integrity with the majority of other brick commercial buildings in the West Asheville-Aycock School Historic District. 1 “Our Expanding City,” The Southern Tourist (March 1926). “Rites Held For Noted Physician,” Asheville Citizen (January 12, 1930). The nature of the business relationship between Anderson and Mardis is unclear. Mardis has his real estate office in the building at 422 Haywood Road. 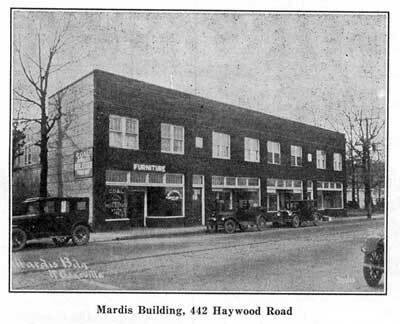 The building at 444 Haywood Road is listed in city directories of the late 1920s as the Anderson Building, but the 1926 article and a plat dated November 1, 1926, identify the building as the Mardis Building. See plat book 11, page 126. Image from the West Asheville History Project.